The Speed Reflex (スピードレフレックス) is a Japanese SLR made in the 1920s by Kuribayashi, and distributed by Saneidō and Sone Shunsuidō. The Speed Reflex has a boxy shape, inspired by English models such as the Thornton-Pickard Ruby Reflex, the Marion Soho Reflex or the Houghton Ensign Reflex. The front standard is mounted on a rack-and-pinion device with double extension bellows, driven by a knob on the photographer's left. The removable lensboard is attached to a plate sliding vertically in the front standard, allowing vertical movements and locked in position by a wheel. The main body has a large viewing hood, hinged to the front or to the rear, and strap lugs on both sides. There is a self-capping focal plane shutter, wound and set by a knob on the photographer's right. The mirror is raised and the shutter is tripped by a lever placed on the same side. The camera has a revolving back, allowing to take vertical and horizontal pictures. Many sources say that the Speed Reflex was introduced in 1919. However an advertisement in Asahi Camera March 1928 says that the camera was introduced three years before. Some sources try to distinguish the tefuda-size Speed Reflex and the meishi-size Speed Reflex Junior, but this is not confirmed by the original advertisements found so far. The same advertisement also mentions a Photoman Special Reflex for ¥125, about which nothing is known. 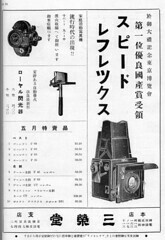 In the advertisement by Saneidō in Asahi Camera May 1929, it is said that the camera received the first prize for "excellent Japanese products" at the Tokyo Fair commemorating the Imperial Coronation, held in 1928 in the Ueno Park. The same prize is mentioned in May and July 1929 advertisements placed by Minagawa Kamera-ten for the Mikuni, also attributed by Kuribayashi. This prize was certainly granted to the Kuribayashi as a whole. No other detail is given in the advertisement for the Speed Reflex, and the illustration is the same as in March 1928. The Speed Reflex is very uncommon. The camera is easily identified by the SPEED REFLEX nameplate and the ES logo embossed on the viewing hood. The two better known examples are pictured in Sugiyama and in McKeown. Both are reported as daimeishi size (6.5×9cm). 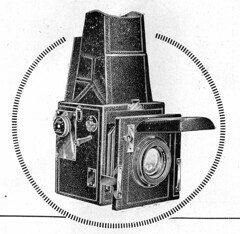 The two examples have the viewing hood hinged to the front, with an ES logo embossed, and have a small SPEED REFLEX nameplate attached to the front of the main body, the same as in the September 1929 advertisement, but none has a lens cover. The two examples only differ by the lensboard attachment and by the finish. The presumably earlier example has black fittings and T, 15–1000 speeds. It is missing the locking wheel for the vertical movements of the front standard. The lens is a Cooke Anastigmat 5″ f/3.9, which is perhaps not original. The presumably later example has chrome fittings, T, 10–1000 speeds and a Yamasaki Congo 13.5cm f/4.5 lens which is probably not original either. Another example, perhaps in tefuda-size, has been observed with a non removable lens board, to which the nameplate is attached at the top of the front plate. Its viewing hood is hinged to the front, and it reportedly has 15–1000 speeds. ↑ Made by Kuribayashi: Lewis, p.36, Sugiyama, items 2028–9, Baird, pp.13 and 39–42, McKeown, p.575. (No original document has been found so far to confirm this.) Distributed by Saneidō and Sone Shunsuidō: Lewis, p.36, Baird, p.42. Advertisements by Saneidō are reproduced in this page. 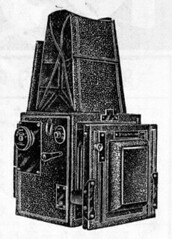 ↑ Double extension bellows: advertisement reproduced in Baird, p.40. ↑ Self-capping: advertisement reproduced in Baird, p.40. ↑ Revolving back: advertisement reproduced in Baird, p.40. ↑ Release date: Lewis, p.36, Sugiyama, items 2028–9, Baird, pp.13 and 39–42, McKeown, p.575. No original document has been found so far to confirm this. 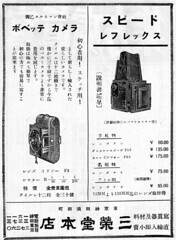 ↑ Advertisement in Asahi Camera March 1928, p.A21. ↑ Baird, p.41, says that the Junior has no lens cover and has the viewing hood hinged to the front. However all the original illustrations found so far show a hinged lens cover, and the distinction between front and rear-hinged viewing hoods does not seem to be related to the format. ↑ Advertisement reproduced in Baird, p.40. 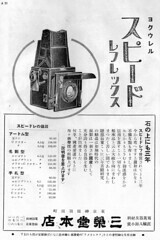 ↑ Advertisement in Asahi Camera March 1928, p.A21: ヨクウレルスピードレフレックス. 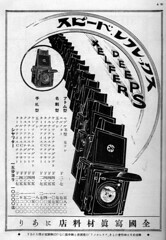 ↑ Advertisement in Asahi Camera March 1928, p.A21. The same thing is repeated in an undated advertisement reproduced in Morishita, p.70 of Kurashikku Kamera Senka no.22. ↑ Advertisement in Asahi Camera May 1929, p.A31: 於御大礼記念東京博覧会第一位優良国産賞受領. The same sentence is found in an undated advertisement reproduced in Morishita, p.70 of Kurashikku Kamera Senka no.22. Exhibition held in 1928 in the Ueno Park: see this page (archived). Baird, p.13, mentions "the Peace Exposition held at Ueno Tokyo" from an unknown source. ↑ Advertisements in Asahi Camera May 1929, p.A30, and July 1929, p.A28: 東京博覧会ニ於テ最高賞優良国産賞受賞シ日本カメラ界ノ面目ヲ施セリ. ↑ Advertisement in Asahi Camera May 1929, p.A31: シャッター一五分ヨリ一〇〇〇〇迄. ↑ Baird, p.42, reports that five surviving examples were known to exist at the time he was writing his book on Kuribayashi cameras. ↑ Sugiyama, item 2028–9; McKeown, p.575. One of these is pictured in Baird, p.39. ↑ Format: Sugiyama, items 2028–9. ↑ Speeds: Sugiyama, item 2028. ↑ Lens: Sugiyama, item 2028. 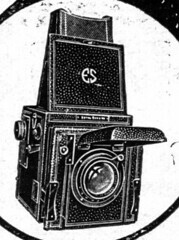 Ars Camera. Advertisement in February 1927. No page number. Asahi Camera. Advertisements in March 1928 (p.A21), May 1929 (p.A31) and September 1929 (p.A30). Baird, John R. Collectors guide to Kuribayashi-Petri Cameras. Grantsburg, WI (USA): Centennial Photo Service, 1991. ISBN 0-931838-16-9. Pp.13 and 39–42. Lewis, Gordon, ed. The History of the Japanese Camera. Rochester, N.Y.: George Eastman House, International Museum of Photography & Film, 1991. ISBN 0-935398-17-1 (paper), 0-935398-16-3 (hard). P.36. McKeown, James M. and Joan C. McKeown's Price Guide to Antique and Classic Cameras, 12th Edition, 2005-2006. USA, Centennial Photo Service, 2004. ISBN 0-931838-40-1 (hardcover). ISBN 0-931838-41-X (softcover). P.575. Morishita Hajime (森下肇). "Atomu-han kamera no subete" (アトム判カメラのすべて, All of Atom-size cameras). Kamera Rebyū: Kurashikku Kamera Senka (カメラレビュー クラシックカメラ専科) / Camera Review: All about Historical Cameras no.22, September 1992. No ISBN number. Airesu no subete (アイレスのすべて, special issue on Aires). Pp.55–70. Sugiyama, Kōichi (杉山浩一); Naoi, Hiroaki (直井浩明); Bullock, John R. The Collector's Guide to Japanese Cameras. 国産カメラ図鑑 (Kokusan kamera zukan). Tokyo: Asahi Sonorama, 1985. ISBN 4-257-03187-5. Items 2028–9. This page was last edited on 23 February 2019, at 06:52.